I want my nine dollars back. But seriously. The Last Song had to be one of the most horribly acted films I have seen in my life. If you are able to look past the fake crying and the hoards of teen boys fawning over the new girl in town aka Miley Cyrus, you can see a hint of a real story. However the beauty of the story line gets lost in the forest of Miley Cyrus and Liam Hemsworth. These are the two people who I place full blame on for the monstrosity of a movie The Last Song was. Between Miley’s “I-just-smoked-sixty-packs-of-cigs” voice and Liam’s mismatched eyebrow/hair combo, I hardly concentrated on Nicholas Sparks’ tale and instead focused on the mistakes of the casting director. Greg Kinnear as Steve is the only actor who gave a bearable performance. But I guess if I had Miley as a daughter I’d be pretty fed up and exasperated too. 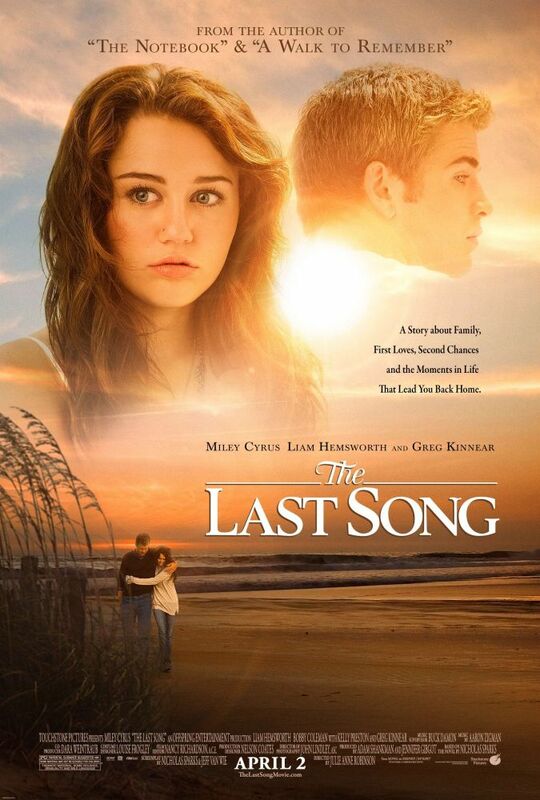 The Last Song tells the story of piano prodigy Ronnie Miller (Cyrus) who moves to North Carolina to spend the summer with her father, Steve. Due to her parents’ divorce, Ronnie is pissed at her father for leaving them, gives him hell by acting out and refuses to play the piano anymore (something that connected herself and Steve). She meets Will Blakelee (Hemsworth) a beach-volleyball playing stud who sweeps her off her feet. Will’s family is loaded and Ronnie has a hard time fitting in with his high class world. Ronnie and her brother Jonah learn that *shocker* Steve has cancer and is pretty much on his death bed. Ronnie has a change of heart and stays with Steve while he dies. She finishes a composition of his and plays it at his funeral aka the LAST SONG. Look how that worked out! There’s also an arson and theft story lines sprinkled in but basically all you need to know is that Ronnie is stupid. I am usually such a sucker for corny romantic crap, but this movie had me laughing rather than “aw-ing”. Who carves initials into a tree trunk after a day? Who legitimately falls in love within a matter of days? Are you really allowed to pull someone into an aquarium tank? That sounds highly unsanitary. I have no heart of stone. I cry at the drop of a hat. But somehow even the knowledge of Steve’s impending death had no impact on me. My floodgates alone remained securely locked during the entire movie. Do you have any idea how awkward it is to be the only one in packed theater who isn’t balling their eyes out? I felt like the Ice Queen, but no, I am actually the only person in the theater who realized how horrible the film truly was. No matter how hard Miley tries to shed her Disney Channel rep and Hannah Montana fame, she is never going to be able to. It’s been years since Lizzie McGuire ended, but Hilary Duff is still Lizzie McGuire in my eyes. Shia LaBouf is still Louis Stevens and Zac Efron will always be that-guy-from-HSM. Disney labels are forever. Face it. My assessment? Don’t waste your money. Don’t even wait until you can illegally watch a pirated version online. It’s 108 minutes you’ll never get back. Nicholas Sparks wrote this especially for her–saw that one coming from miles away.